Today someone said to me: “the world is watching you…”, referring to Sri Lanka… And I was stumped for words. What I realised is that whatever a small minority of the population does reflects on all Sri Lankans, whether it’s good or bad. In this instance I’m talking about a small group of Buddhist extremists who are claiming to be the true Sri Lankan’s and are fighting to abolish the halal system in the country. We may not agree with them, but as long as we stay silent and not do our part in standing against it, and standing for the unity and beliefs of every ethnic and religious group that makes Sri Lanka as special as it is, to the rest of the world it seems like we agree with it. So here I am, doing my part in the smallest way I can to share the message that this is not what Sri Lanka is. 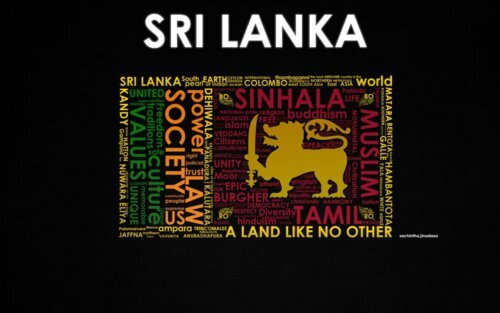 Sri Lanka does not denote “Buddhism”.Sri Lanka is all those interesting mixtures of friendly and beautiful people; from Sinhalese to Tamils, Muslims, Malays and Burghers and from Buddhists to Hindus, followers of Islam and Christianity and even the non-believers. We may be different but what we have in common is far greater… And I urgently appeal to those devout Buddhists who know and follow the true teachings of the Lord Buddha, for those who have a voice that is respected by the Buddhist population… speak up and stand up for what makes us Sri Lankan. I would like to add this beautiful piece of work by Shara Sekaram (which I found posted on Facebook) of what it means to be SriLankan. I hope that just like me, you can draw some inspiration from this too. We’ve barely worked our way out of one ethnic conflict and already trouble makers of Sri Lanka are starting up the next one. Anti-Muslim this and that, a small minority to be sure, but a frighteningly vocal one. They insist that we must protect ‘Sri Lanka’ and that they are ‘Sri Lankan’. To me, I have never imagined myself as any less Sri Lankan because I was from a minority that was not how I was raised, and that was not how the people around me saw themselves. But what scares me is that as a nation we spend so much time drawing lines around our communities, that we forget the things that bind us together as Sri Lankans. To me, those are the best things we have. To me being Sri Lankan means having your mouth water at the thought of achcharu in little siri siri bags. Thambili on a sweltering day. Horrific traffic and people driving like they are blind. The Mosques call to prayer broadcasted on their speakers mingled with the nearby temples chanting. Waving to the elephant when we pass the Gangaramaya Temple. The smell of Siddhalepa when one is sick. Feeling a thrill when some random Hollywood movie mentions ‘Sri Lanka’ and re-watching that scene for that reason. Complaining about internet speeds. Being Sri Lankan to me means always having your breath taken away when Vesak comes around, and the whole city seems to come alive. Eagerly waiting to see what magnificent Christmas decorations Odel and the 5 star hotels will dazzle us with. Plates of biriyani at Ramadan. Blessing our multi-ethnic society everytime a long weekend comes around. Double blessings when we find two in a month. Araliya trees in bloom. The tree lined Thurstan Road. The smell of sandalwood in Wellawatte. Calling everyone ‘Aunty’ and ‘Uncle’. Everyone knowing or being related to everyone. Everyone having family who lives in USA, Canada Australia or all three. Family dinners that don’t serve food till 10pm. Always asking someone new you meet – ‘What school did you go to? Oh, what batch? I know so-and-so’. Lavish Weddings. Jumping with excitement every time an American fast-food franchise opens up. Freaking out at cricket matches. Sighing whenever you go abroad and someone assumes you are Indian. I feel Sri Lankan because of all these things. This is what Sri Lanka is to me. No matter whom they accuse of heading conspiracies and how they try to divide and alienate us, I just need to remember that there are things that bind us together, no matter how different our lives are. But I fear that while the rest of us refuse to raise our voices, this small angry minority will rip us apart. And when we allow that to happen, it is our children who will weep. Like our parents left us a war torn nation to fix, we will leave our children a shell of a nation. Is this what we want? Previous postWhen will the Universal Declaration of Human Rights be truly universal? Great Blog Tasha. In any such controversy it is only a few people who have motives [be it genuine and ulterior] who start it. Then since it is newsworthy the media highlights it. Those exposed to such news perceive that this is a general truth about that country, community, religion, political party etc. Persistent exposure of such stories even results in that group getting labeled and branded accordingly. There is always 2 sides to a story and one side believes and support one side of the story and vise versa. one mans terrorist is another mans freedom fighter. We need to learn to see the issue from the other side as well to make real sense. There are no easy answers or solutions to this human dilemma, but we need to do our best to find it. Pingback: හලාල් යනු කුමක්ද ?